I have shown my bowls and vessels with tiny holes cut in them to many people, and without exception their first comment was... how in the world did you do that? And my reply was, very carefully. The process is called piercing and is accomplished with an air powered super high speed handpiece. I am talking 350,000 to 400,000 RPM and no, I did not add an extra zero. You could spend as much on a professional piercing system as you would on a very nice middi lathe. What I will show you is how to get the same results for less than $100. I gave this demonstration 4 years ago and there have been several improvements in the handpieces and associated components. I will discuss pros and cons of air versus electric and handpiece options. I will assemble and demonstrate an air powered system that is easy to build and easy on the pocket book. I will also provide information on some relatively inexpensive upgrades that can be added any time. Johnny & Marcia will be doing a dual demonstra­tion. Johnny will be demonstrating how he turns thin Maple disks for Christmas Ornaments. The disk when finished will be about 1/8 inch thin or thick depending on how you call it. Johnny will demonstrate the use of the Hunter micro tool and the shaping of the disk. He will discuss how he prepares the maple wood to save time and wood. He will then go through the process of turning one side, sanding that too very smooth finish. The sanding will be by the power sanding method, hand sanding could be used if one wishes. Johnny will then use his alternate method to turn the other side and sand it smooth also. He will discuss the use of a vacuum system, but as some do not have a vacuum system he will only talk of that procedure. Questions are encouraged throughout the demonstrations. Johnny will then turn the dem­onstration over to Marcia where she will explain how she deco­rates the disks with pyrography. Marcia will cover patterns, burning tips, finishing and other secrets that you will not want to miss out on. At the end of the dup demonstration, there will be hands on time period for those that want to try the Hunter tool and or to ask Marcia any ques­tions. I grew up around my dad’s woodshop and became a journeyman carpenter when I was 19. Carpentry skills helped pay my way through engineering college which led to a career in the oil and gas industry. I maintained a woodshop over the years but like everyone working and raising a family there was little time to use my tools. About 12 years ago I took a Basic Turning class at Woodcraft taught by John Horn and started woodturning in earnest. I have always liked a challenge and the “Goblet with a Twist” is certainly that. It combines knowledge that I gained from two guys named Stuart. The first thin stem goblet I turned was in a class taught by Stuart Batty about seven years ago. 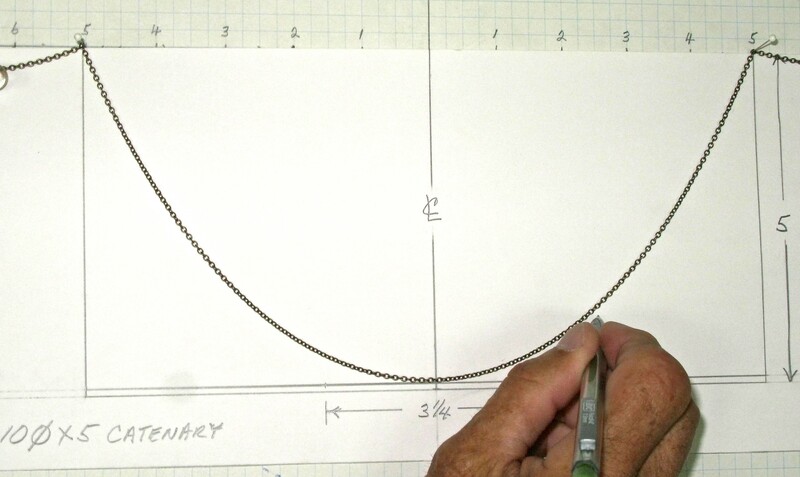 I learned about the classic techniques for spiral (twist) turning by watching a demo by Stuart Mortimer and then reading his book. 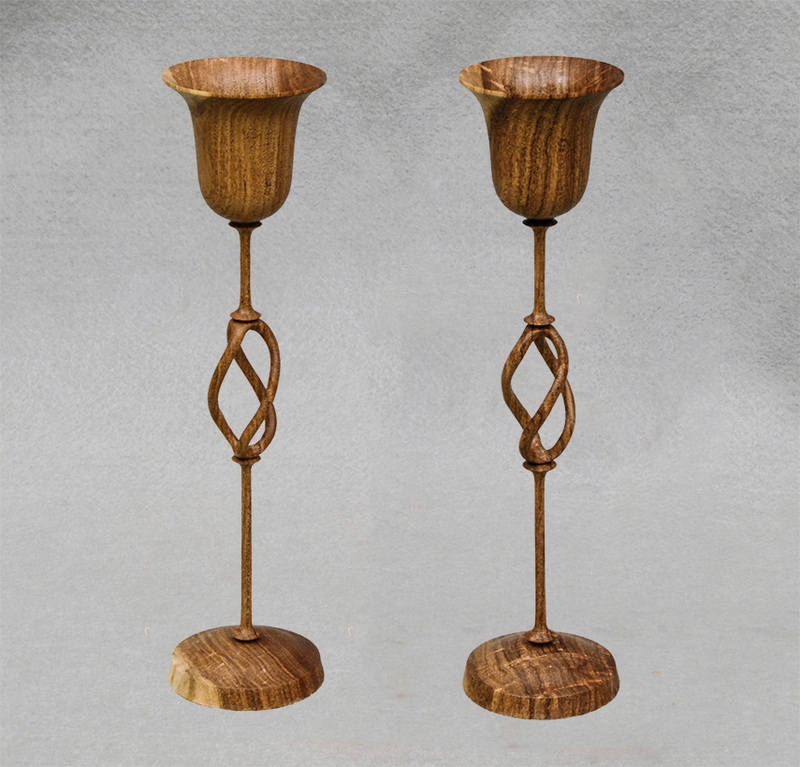 The “Goblet with a Twist” is an intricate project that requires the work to progress in a certain sequence of steps. It takes me about 4 hours to complete a goblet about half of which is sanding time. For the demo I will focus on the turning elements, rough carving and rounding the bines. There won’t be time for sanding except as needed for shaping the bines. Also, to save time I will not show some of the work holding (chucking) changes that I typically use but will explain how these are done in the work flow. The literature on bowl design discusses the classic curves – sphere, catenary, and ellipse, proportion based on the Golden Mean, and considerations for proper foot design leading to the conclusion that if you turn to these parameters it will be an appealing bowl. Then, ironically, you don’t find pictures showing the results. Therefore I decided to find out for myself. The demonstration will cover how to draw each of the curves and make templates for turning including the foot to proportion. We will look at 21 bowls where the height is held constant and the diameter varied over a range to compare the curves and introduce the concept of an aspect ratio to identify differences and similarities of each curve over the range of diameters. Then we will look at another dozen or so bowls where we increase both the height and diameter. Let’s have some fun and a lot of interaction to see what we can conclude from this work that they don’t tell us in the design literature. My demonstration will focus on two types of homemade sanding devices, a foam ball sander that may be used for power sanding concave surfaces such as inside bowls and hollow forms and simple home made substitutes for over-price sanding platforms. The foam ball is the brainstorm of David Reed Smith after seeing the Guinevere® system marketed by King Arther's Tools. The Guinevere is a miniature pneumatic sanding tool. Smith, who had used glued and shaped craft foam for another project reasoned that the foam could replace the pneumatic pieces for interior sanding. These sanders may be constructed with velcro® to use the hook loop sanding discs, or regular sand-paper may be mounted on the mechanical ball. In the image at right is a sanding ball with the velcro attached. I have been turning for a few years now, and though I have tackled the obligatory pens, bowls, and goblets, I left the peppermills and salt grinders to the folks with more experience and talent for machining wood. I imagined the precision required and thought the mills and grinders did not lend themselves to my freeform, un-planned turning style. After all, I very rarely know how my pieces will turn out and that, it seemed to me, would rule out projects that require such tight tolerances. Little did I know, there were options within the realm of grinders and mills that did not require such a high level ofprecision. This is due mainly to the one piece form factor, but also because of the smaller size of these kits. One of the kits I will demonstrate is actually turned on a mandrel using bushings like an oversized pen barrel. Two of the kits I will demo use crank handles to drive the grinding mechanism and I personally think they have a great retro look. But as several of my customers have mentioned, they can also be easier to operate for folks with less strength or hand issues. These kits can be turned with smaller pieces of wood and can take virtually any shape. Part of the attraction these kits hold is the virtually unlimited shapes that possible. I developed a signature shape I call the “Handfull” grinder which is larger than a normal grinder but fits even small hands comfortably. I think sometimes people are hesitant to turn traditional grinders and peppermills because they think it needs to have a traditional look. But grinders can take any shape, and the single piece designs can lend themselves to experimentation. If I am speedy enough and get through the first two designs with some time to spare, I will demo a third peppermill. This one is more of a traditional style grinder, but with a slight “twist” (pun intended). The top of the mill, the piece you turn to grind the pepper, is also a salt shaker complete with a perforated chrome top. This kit is a bit more complex to turn, but well worth the extra effort. I hope you can be at the WNT meeting on June 27th. I look forward to seeing you and getting “Back to the Grind”. The May program will kick off the new season of making Empty Bowls. There will be four lathes turning Empty Bowls at the same time to emphasize the point that there is no restriction due to the size of your lathe on your ability to contribute to the empty bowl project. Glynn Cox, Paul Tiefel, Randy Johnson, and Chas Thornhill will be demonstrating their bowl turning techniques on the various lathes that will be placed around the meeting room. Everyone will have the opportunity to watch the process "Up close and personal". While only 23 members of the WNT turned 157 bowls for the 2013 Empty Bowl Event, our goal for 2014 is to have everyone in the club to participate by making at least one bowl a month throughout the rest of this year until the event takes place next March. A person with absolutely no experience can turn an acceptable bowl in about 3-4 hours or less with the supervision of an experienced mentor. 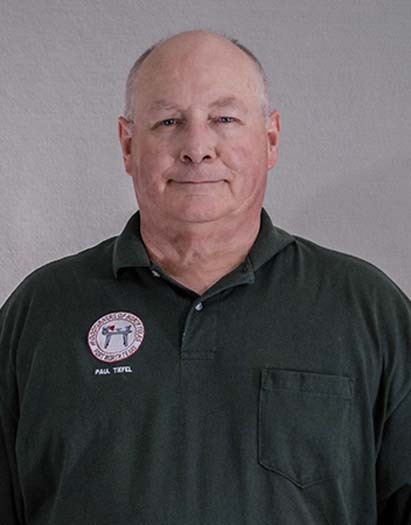 Our club is blessed with a number of people that are glad to help any member solve the mysteries associated with producing most any kind of bowl. These people will be identified in the newsletter and in the May meeting and you will be encouraged to contact them to arrange sessions that will solve any problems you might have in producing your own bowls. Robert will take a american cherry log, 13 inches across, and split it with a electric chain saw down the middle length wise. Next he will lay out the eight sided bowl to get the best position in the half of the log. He will mount it on the lathe with spur center and live tail stock. Then will round back or bottom and cut a dovetail tenon, then will reverse mount it on a four jaw chuck and flatten the top to get even thickness with the bottom. Then proceed to hollow out the center with sweep back ground gouge. As the turning progresses he will measure the thickness with calipers. Sanding down to 320 grit he will put a water based acrylic finish on it. 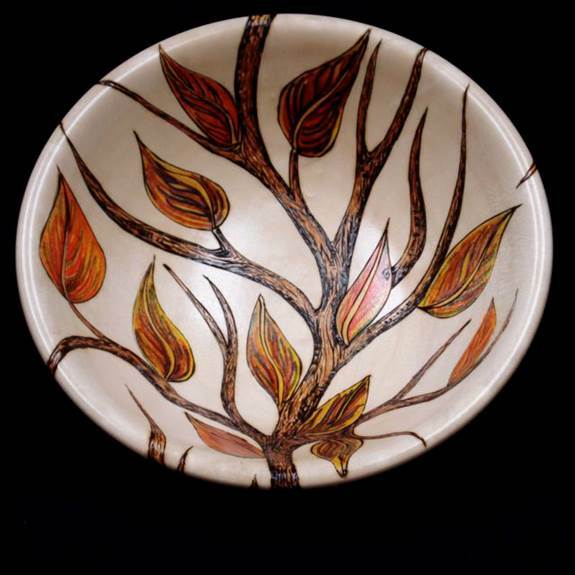 Robert Trimmell began woodturning at Oklahoma Panhandle State University in the early 1970s. Life happened and he married a East Texan, where he found an abundant supply wood! 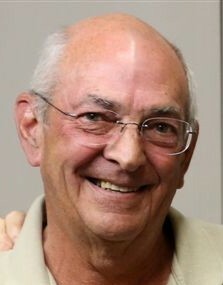 He and his wife Dolly built a home on Lake of the Pines. He bought a Shopsmith to build the house and started his woodturning hobby that became his passion. 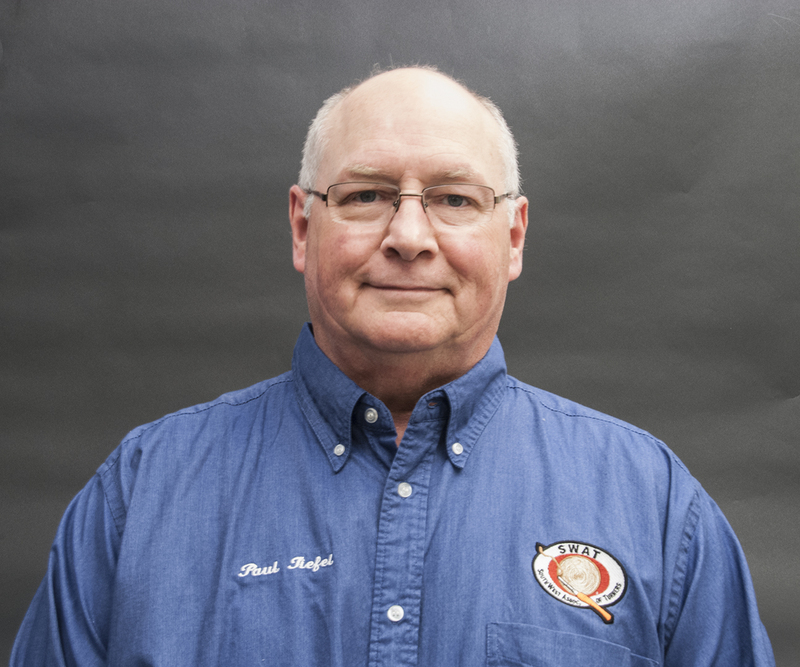 He joined East Texas Woodturners many years ago. He enjoys teaching at Studio 190 in Lone Star, TX . Barbie and Jimmy Holton are native Texans dedicated to using their talents to create woodturnings and gourd art. With Barbie’s study in various fine arts and crafts since childhood, she is constantly trying new directions. Jimmy’s innate design ability completes the team. They have been turning for about 13 years, since the Hill Country Turners took them under their collective wings to encourage their efforts. The Holtons hail from the Houston area. Art, teaching, travel, children, business, sailboat racing, and woodturning have all been a part of their lives. Thru the years, Barbie has taught art at almost every level from kindergarten to adult. 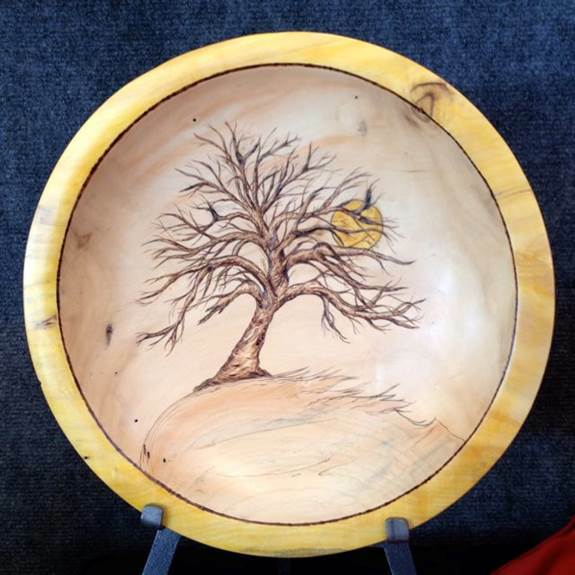 Her current teaching has revolved around woodturning, gourd techniques, and pyrography. Barbie will be demonstrating Basic Pyrography. She and Jimmy will be sharing equipment choices and favorite burner needs. Easy woodburning techniques and uses will be shown. 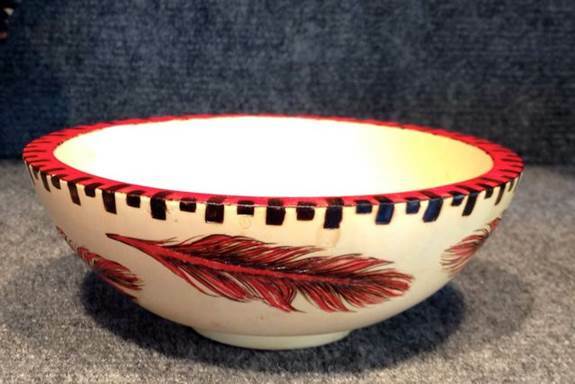 Tips and simple tricks for embellishing bowls will be included. Direction will also be given to the more experienced woodburner. Selling your turned art or virtually anything on the Internet is tricky. Or suppose you have been asked to contribute to an event (Think 2-for-1 Raffle SWAT) but the organizers want an interesting photo to show off your work and advertise the event. It is not always easy for the visitor to assess the quality of the work, but good photographs can go a long way to remedying this. It is important to remember that a picture on the web is typically just a few hundred pixels wide and high. It is not easy to show the qualities of your work with such low resolution. In this demo I will show you some of the techniques I use to improve the quality of my pictures. A quality photo is especially important if you are trying to create a portfolio of work for sale, or for submitting to a juried exhibition., I am not a professional photography, just an informed amateur who has to evaluate photos for website and large auditorium display. It is not that hard to improve the quality of your photos using material you may already have in your home. Meaning cheap, we all know that the most expensive tool or lathe does not a great turner make!, Whether you are taking simple photos for eBay auctions and Internet forum postings or high-resolution photos for publication, here is a simple, inexpensive project idea that will help improve your photographs. Regardless of the camera being used, controlling the lighting and eliminating background distractions will allow you to do a better job. This demo will show you how to make an inexpensive light tent to use for photos of smaller turnings and provide you with a few simple tips will help get the most out of each photo. 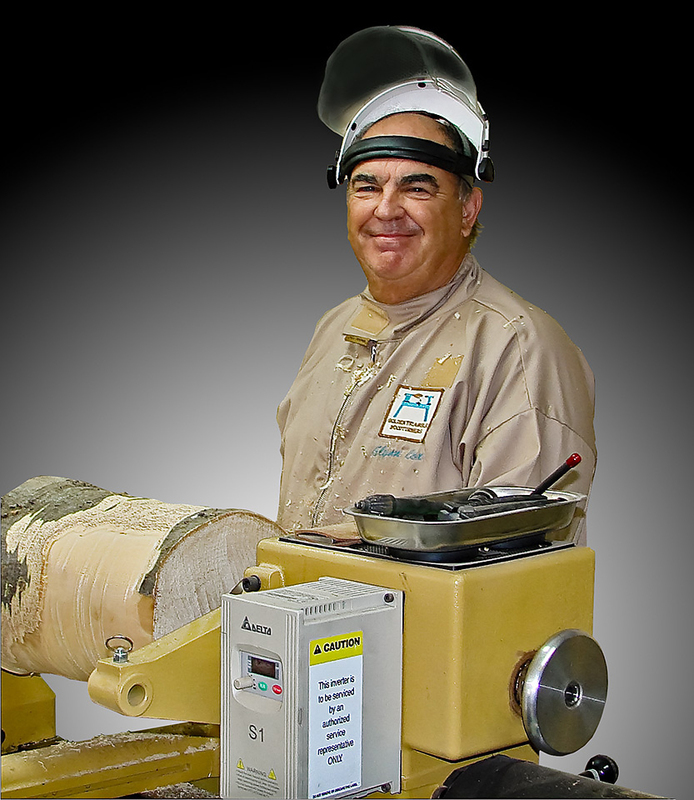 Stormy Boudreaux, past WNT president, life long woodworker and a turner since 2004. Currently the chairman for South West Area Turner’s “2 for 1 Raffle”. Finishing can be a confusing and mystifying subject to many. This is compounded by package labeling which doesn’t always reveal what a finish product actually is. In this introduction to finishing Chris Morgan will describe the various types of finishes and show a variety of products. Each will be classified into the type it represents. Finishes are based on the solvent they use and the type of material it is made from. Solvents can be mineral spirits, alcohol, lacquer thinner, or water. The finish type can be oil (e.g., tung oil, linseed oil) , shellac, lacquer, varnish (polyurethane), or wax. Some products combine these products. Danish oil, for example, is a combination of an oil (either Tung oil or Linseed oil) and varnish (or polyurethane). More modern finishes used by professionals are catalyzed finishes, either pre-catalyzed or post-catalyzed. Other types of finishes can include glues (CA glue) or epoxy. During the presentation Chris will give some of the history of traditional finishes, how you can detect what finish you have on a piece, how to tell what you are getting at the store, and some of the properties you can expect from various products. There will be a discussion by John Beasley & John Solberg on surface preparation and treatment before finishing followed by finishing from the quick and easy to a blemish free high gloss for display items. Golden Triangle Woodturners supplied about 350 bowls in 2012 to the Empty Bowls program. Have you ever wondered what would happen to finishes applied to them when they come in contact with food products? Plan on attending this meeting and learn the answer to that question.